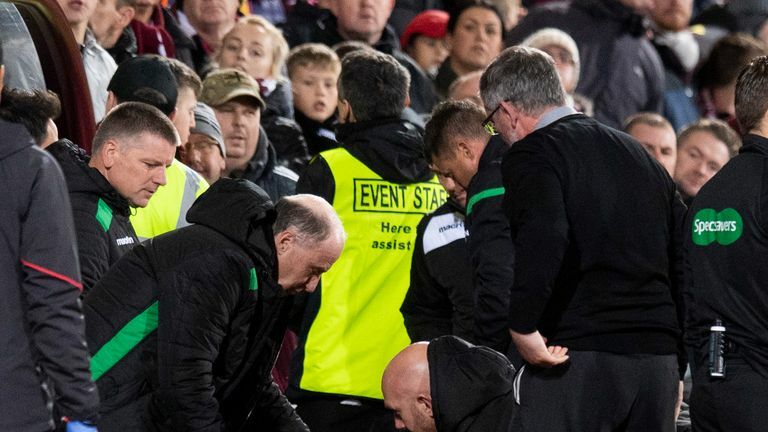 Andy Walker has described the incidents of violence that marred the match between Hearts and Hibernian as 'disgraceful', and called for the problem to be tackled head-on. Andy Walker says "disgusting' behaviour from supporters has been allowed to continue unchecked for too long. Five arrests were made after the 0-0 draw between Hearts and Hibernian on Wednesday night, during which Hibs manager Neil Lennon was struck by a coin and Hearts goalkeeper Zdenek Zlamal appeared to be struck by a fan. Asked what he thought of the unpleasant scenes, Walker told Sky Sports News: "It is a huge concern. "It is not so long ago we saw something similar at the Livingston-Rangers game, where a linesman was struck on the back of the head. "I think any manager, any coach, any player, any official, is entitled to go to their place of work and feel safe, and that is not happening. "I think the behaviour in general from supporters, it is disgusting. "The verbal abuse, never mind what you saw last night, on a weekly basis, I think we let it wash over us and we do nothing about it. "But, when you see a goalkeeper being assaulted, when you see a manager like Neil Lennon having something thrown at them, that could easily have blinded him. "His partner and his son were at that game last night - how do they feel? This is really important and we need to do something about it. "We should look at giving them [the fans involved] lifetime bans from football." Walker does not think poor behaviour from supporters is a recent development and is of the opinion the response so far has been inadequate. "It is disgraceful scenes and it has been going on for a long time," he added. "Any time when I make my way from the gantry round to the tunnel after the game, and you pass a corner flag, there are half a dozen coins and one or two disposable lighters. "This happens all the time and, when you add in the disgusting verbal abuse, the language that is atrocious from supporters, we should tackle it head-on."